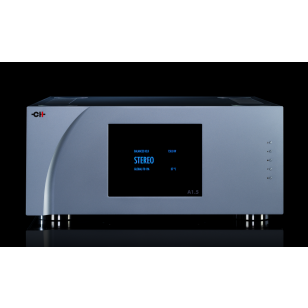 CH Precision A1.5 Amplifier ( available in Stereo or Mono version). Meet the A1 successor. Featuring a huge new power supply design, the A1.5 power amplifier effortlessly delivers up to 150W / 8 Ohms per channel in Stereo mode or 1200W / 2 ohms in Bridge mode. The A1's flexibility of use and future-proof modularity have been kept untouched allowing the amplifier to be reconfigured from Stereo to Bi-amplification, Monaural or to Bridge at the push of a button. CH Precision’s unique ExactBias circuitry as well as the critically acclaimed loudspeaker matching topology forge the heart of the A1.5. Further refined, taller, more powerful, the A1.5 is in every way an A1... and a half! The central power supply is taking most of the internal space of the chassis. The huge 1'700VA transformer is mounted on silent-blocks to avoid at maximum its vibrations to be fed-back into the sensitive part of the circuitry. It is shielded both with a magnetic screen and an electrostatic one. The transformer plate is also secured for transportation. A gain range of 24dB - with steps of 0.5dB - is embedded into each channel, for a perfect match with the loudspeakers sensitivity and room size. A lower gain is typically preferred for high-sensitivity speakers into a small room while a bigger gain is sometimes needed for large rooms with low-sensitvity loudspeakers. Like with the A1, the A1.5 output stage features the CH loudspeaker matching circuitry. The ratio between the global and local feedbacks is adjustable on-the-fly from the front panel user interface or through our tablet app. Each step is 20%, going from 0% - local feedback only - to 100%.